Available as custom request only. Please contact us for assistance: info@polysciences.com. 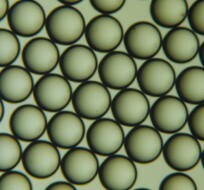 Polysciences Inc. offers microspheres comprised of two PLGA polymer ratios (50:50 and 75:25 Lactic Acid:Glycolic Acid) in three narrow sizes (75µm, 100µm and 120µm; 5-10% CVs). These highly uniform particle populations serve as excellent models for controlled degradation rate measurements, and for the development of prototype scaffolds or devices.